Santoshi Maa has been captivating the audience ever since the launch of the show. Santoshi’s journey on the show has been a tough one. However, her grit and determination is something that has been appreciated by the audience. Turns out the makers are taking audience appreciation seriously and introducing a new segment in the show and Poonam Dhillon has been roped in for the same. Every Friday, the episode will see Poonam Dhillon as the sutradhaar sharing real life anecdotes and insights on Santoshi Maa. From why one shouldn’t eat sour things whilst fasting, which has a scientific reasoning to it, to maintaining a balance within to having a positive outlook towards life, Poonam will share it all. 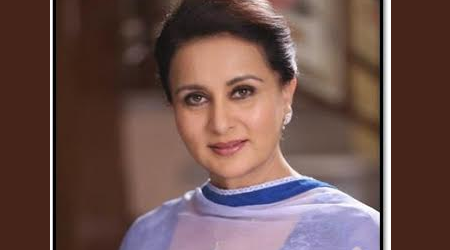 Says Poonam Dhillon "I am a spiritual person by nature and i personally like watching santoshi maa. I think the trials and tribulations faced by the characters are very believable & everyone has gone through samilar situations at some point in their life. The very idea to belive in that higher power to make oneself stronger & knowing that someone is watching over you in troubled times ,that you are not alone. That's exactly what I am going to do in the show as well. It's a special segment on Fridays that I will be seen in, as myself, wherein I will talk about the positiveness and belief."